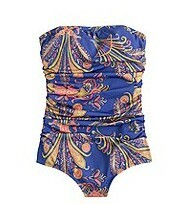 I have mentioned in the past my disdain for swimsuit shopping and that says a lot coming from a girl who loves to shop! I fully blame Eve for the complex and anxiety it causes. Hearing that it’s swimsuit season as our culture defines it, can be like nails on a chalkboard. For many women it overshadows the joy and fun that should really come with summer, as we are consumed with trying to fit in a suit. While growing up it seemed the only option for a bathing suit was itsy-bitsy. It was next to impossible to find an alternative that didn’t make you look like you were preparing for a swim meet or just turned 80. I remember going on our senior class trip in high school and feeling so self-conscious being shoved into a swimsuit just to keep with the trends. Constantly comparing myself to all of the other girls and dead lining to the shore to quickly throw on a cover up. The reality is we shouldn’t have to fit a mold. Our bodies move and curve in different ways. Each beautiful, each unique, each wonderfully made! In recent years I feel there have been a few more options when it comes to donning for the beach. I thought I would share a few finds in case you were becoming discouraged. Additional sites that have some great options are ModCloth, LOFT and Lands End has a lot of shorts, skirts and some cute rash guards. All very cute. I’m in need of a new swimsuit very badly! Good options! If you are still looking, I got a Lime Ricki suit a couple years ago that I love. Expensive, but good quality, and definitely cute without the itsy-bitsy!